Imaging being on your own on the beautiful private island. Enjoy every minute being outside of the city rush. Don't forget to look at the night sky. This place gives unforgettable experience and provides enjoyment that is offered nowhere else on the globe. It’s the place people go to escape a place made of cabins, pine trees and lakes. But no matter how far you drive there’s no sign to say “You’ve arrived.” So just follow your heart til you find your special place that brings peace of mind. As you breathe in the air and unwind your cares are all left behind. It’s no mystery where the northwoods start. When you’re “up north” you’ll know in your heart. — Suzanne Kindler 1996 An artist's paradise! Catch & eat fresh fish every day! Spend a relaxing afternoon in the hammock reading a great book! Or go out in the kayak with your camera. It's a photographer's paradise as well. You are located between the towns of Espanola and the quaint little town of Little Current, Ontario. Both are approximately 1/2 hour car ride where you can stock up on groceries. You are surrounded by beautiful pristine water. You are on your own island. The front and back decks are literally steps from the water. There are some mountain views from the back deck. From the back deck, you can view all sorts of wildlife.........deer, moose, bear, blue heron, sandhill cranes, etc. From the front deck, you can see the fish swimming in the water. Fireplace, space electrical heaters in each room. Each bed is outfitted with a down-filled comforter. A fresh duvet cover is put on for each change of guests. Luxury sheets & Pillowcases are provided. Yes, we provide bath towels as well as beach towels. A woodburning stove insert has been installed into the fireplace. It is much more efficient than what the fireplace was. Anything you could possibly need! There is a dining table on the front screened-in porch. If you pull it out, six people can comfortable sit around it. There are six dining chairs. There are some toys up in the loft. Back deck facing a beautiful body of water. Front deck where you will see sunrises to the right and sunsets to the left. Enjoyed every minute of it! Intend to go back. Lovely, clean log cabin. great swimming from the dock. Well stocked kitchen. Fifteen minute kayak ride from the marina. Lots of places to visit, swim, hike, climb and kayak. Nice owners. plenty of room for all of us and all the ammenities of home. Fishing in the bay and right off the dock is unbeatable (many 30" pike, 20" bass and even a muskie). kids had a great time and the owner Dmytro was awesome to deal with. Cottage comes fully stocked and even has washer and dryer for laundry. Highly recommend whether for a family or a group of adults, you wont be disappointed. We had a lovely week at this traditional, yet very comfortable, MacGregor Bay cottage. Our hosts Dmytro and Olena made sure all the details were in order before our arrival so the kitchen was well stocked with essentials and a thorough briefing was given both before and upon arrival to the cottage. The cottage is a 5 minute boat ride from the Stillwater Marina. Since we were not very familiar with the waters around the Bay, this was very helpful. MacGregor Bay can be pretty tricky to navigate by boat as there are a lot of shoals and difficult channels so being so close to the mainland was a comfort. We rented a small boat for the week so we could explore the area at our leisure. There were 2 kayaks as well so it was fun to paddle around the back of the island. There was a beaver and/or a muskrat that made his appearance most nights as we ate on the back deck of the cottage admiring the view and the wildlife. Hummingbirds flew in to the feeder often and we saw large herons and many loons out on the lake. The cottage was clean and well kept. We comfortably slept 7 people. There are two bedrooms and a part of the living area that functions as another bedroom. For us, we did not mind this “communal” living arrangement at all because we were with family. I wonder if the small artist studio might one day be converted into a bunkee? There are 2 bathrooms and 2 showers so the facilities were ample. There were plenty of towels-both bath and beach towels. The fishing at this cottage was very good, even just off the dock. My husband and daughter went out with a guide from Stillwater Fishing (Brian) and my husband caught a 20 pound muskie! Stunning, Amazing, Best Vacation ever! We rented the week of July 19. There is not enough amazing words to describe this vacation. I have teenagers and they absolutely loved it, and keep asking when we are going to go back. We caught fish off the dock every day, and in our boat my husband landed his first Muskie. Lots of things to see, and we were introduced to lots of wildlife which was the highlight. A vacation that will never be forgotten and one that we will definitely do again if you will have us. Thank you so much for this review. You are welcome back anytime. It is so heartwarming to hear that you see the same beauty we have seen for 50+ years. Glad we could share it with you! 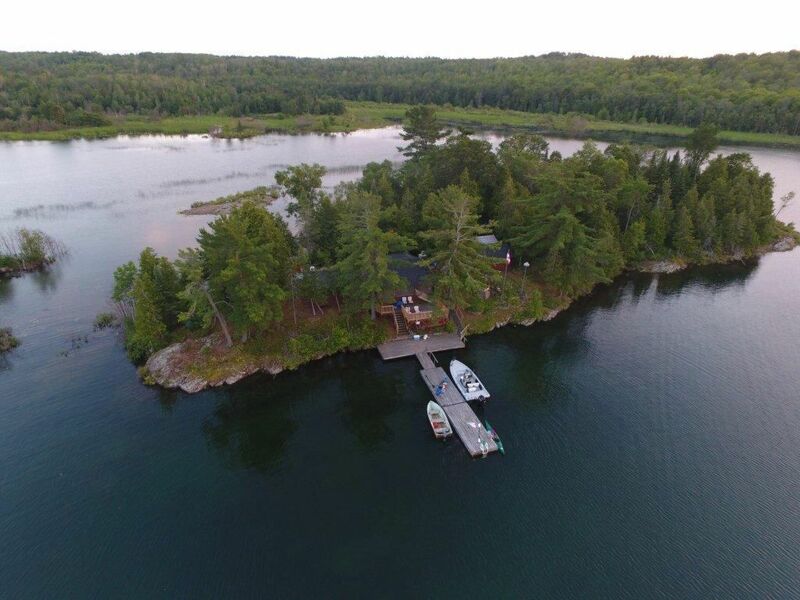 Wonderful rustic island cabin with all of the amenities. Great sunsets and sunrises from the two large desks along with morning wake-up calls from the pair of loons that cruise the nearby waterways. The fishing was great from both the boat and the two docks (nice to separate the teenage fishermen and their hooks). Our teenagers loved exploring the island to find just the right fishing spot. They even found a great spot for their overnight hammocks with great water views. The early morning visits to the dock by the resident mink was quite a treat although the 30 minute dock visit by the river otter was outstanding. On the deck, we were close enough to hear him enjoying his fish catches. The cabin is well stocked but is starting to show a bit more of the rustic elements. The caretaker Jerry could not have been more helpful. This was one of the few vacations that I really did not want to leave. Given the rocky island edges and the depth of the water, I would not recommend this for young children. For teenagers interested in the outdoors, the internet was of no interest, they went for the kayaks and fishing versus their game consoles. Bring a great book, as the decks are ideal locations for a great read. We spent one afternoon off the island and enjoyed a great harbor walk in Little Current (20 minute drive) along with a great fish dinner at the Anchor Inn. Thank you so much for that lovely review. It always makes us feel so good when people enjoy the natural beauty as we have over the years. This cabin has been in our family for over 50 years. We are getting older now and it's harder to travel up there than it used to be......so if we can share it with people that love nature and rustic living, it brings us much joy. 1. Although the cottage is rustic, it is well equipped with modern appliances that all work, well-stocked kitchen, games, puzzles, music center with lots of great cassette (remember them?) compilations, large modern barbeque, powerful showers, well-stocked herb garden. It is also roomy. 3. So relaxing - I decompressed in about half the time it usually takes. Being on an island makes you less prone to always wanting to be doing something. I made a new friend in the hammock on the front deck, where I variously had afternoon naps, drank early evening cocktails watched the sun go down but generally hogged. 4. Plenty to do; great fishing (you don't even have to leave the island, I had a fine time off the dock and at various other points around the island), kayaks for your use, a useful boat with outboard (lots of PFDs), swimming, cruising the islands and the hot tub, which was our kids favorite. 5. Really helpful and friendly caretaker (Jerry). None really. Espanola (North on 6) is where to get your groceries on the way through, but is a bit grotty. Little Current (South on 6) is closer and quainter. What was once obviously a beautiful garden is a little overrun now, so bring your gloves and trowel if you are a gardener! If you do get off the island (and I recommend not), then the Red Dog Grill at Whitefish Falls is friendly and has good food. Went away with some lovely memories and our kids declared it their best holiday ever, despite the lack of computers. If you like nature and pristine water to swim in, you will love our island. You can catch your dinner right off the front dock, or jump in for a refreshing swim. Or just take a nap in the hammock on the front deck.